3 drawers keep art supplies organized. Great for storing pastels, charcoal, pens, erasers, blending tools and much more. Each drawer has 5 compartments to organize supplies. Solid beech wood construction for daily use. 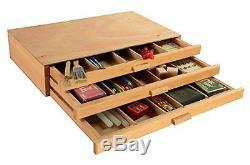 This wood art box has 3 drawers for storing an assortment of art supplies. Each drawer has 5 compartments to keep tools organized. The 3-drawer wood pastel box is constructed from beech wood, which is both durable and lightweight. The art box is ideally meant for storing pastels, charcoal, brushes, pens, erasers, blending tools and other smaller supplies. Dimensions: Overall: 15.75"w x 3.25"h x 9.75d Weight: 6 lbs. The average time in transit is only two days for most orders. Occasionally orders may take longer. What is the expiration date on this item? All of our items expiration date is sufficiently in the future. We do not sell items that are expired or rapidly approaching expiration. Our items are warehouse and the exact expiration date of the item you receive can not be explicitly guaranteed. We don't know automatically. The only way to get the final cost is to go through the checkout and enter your address. Can you cancel my order? To ensure that all of our orders go out as soon as possible we use an automated system. At any given time there are as many as 5000 orders in process, so tracking down and stopping an individual item is generally not possible. Please be sure you want the item before checking out. Does this item come with or do X? Feel free to ask us, but don't be surprised if our support representative isn't intimately familiar with the item. In most cases the only information they will have available is what is on the product's listing page. Does this electrical appliance work on US voltage? Yes, all our items are designed for US voltage and plugs, as such they will require voltage converter and plug adapter for your country. We strive to offer satisfaction for all customers and are very accommodating and do our best to help resolve any situation you may have with an item. Electronic items must be unopened. If an item arrives damaged or defective please document it and notify us immediately. We take extreme care to not violate any trademarks or copyrights and assure that our listings are not in any violation. If a VERO complaint is filed against our listing we will file a counter-notice and should any damages occur based on the false VERO claim we will be forced to seek compensatory as well as punitive damages. The item "Displays2go ARTSNH8B 3 Drawer Wood Art Box for Paints Charcoal Tools Set of 5" is in sale since Tuesday, April 26, 2016. This item is in the category "Crafts\Art Supplies\Drawing\Other Drawing Supplies". The seller is "shall78" and is located in Multiple Warehouses. This item can be shipped to United States, to Canada, to United Kingdom, DK, RO, SK, BG, CZ, FI, HU, LV, LT, MT, EE, to Australia, GR, PT, CY, SI, to Japan, to China, SE, KR, ID, to Taiwan, ZA, TH, to Belgium, to France, to Hong Kong, to Ireland, to Netherlands, PL, to Spain, to Italy, to Germany, to Austria, RU, IL, to Mexico, to New Zealand, PH, SG, to Switzerland, NO, SA, UA, AE, QA, KW, BH, HR, MY, TR, BR, CL, CO, CR, DO, PA, TT, GT, SV, HN, JM.